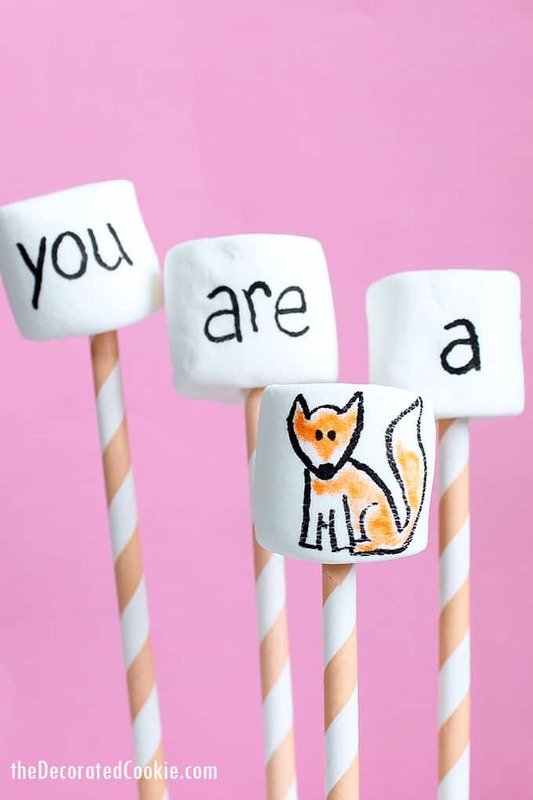 Use marshmallows and food writers to make simple “You are a fox” marshmallow pops this Valentine’s Day. In case you’re wondering, yes, I did have Jimi Hendrix’s “Foxy Lady” in my head the whole time I was making these. And now you do, too, so you’re welcome. Know any foxes? I think they might like to know you think they are foxes. 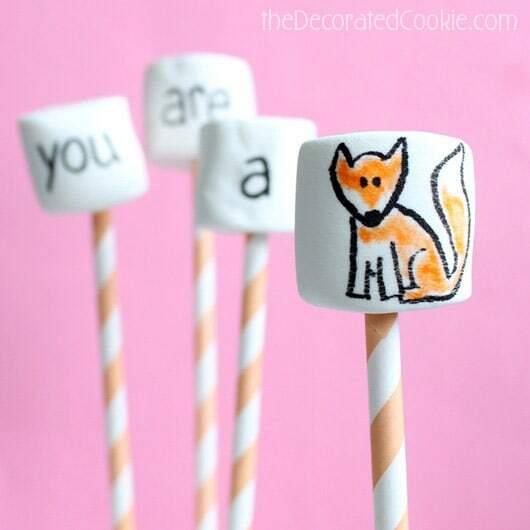 So for Valentine’s Day, you better spell it out in marshmallows, “you are a fox” marshmallows, that is. 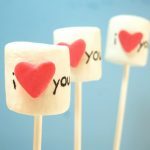 You are much less vulnerable if you spell sentiments out in Valentine’s Day marshmallows. By the way, despite living in Washington DC, I’ve seen a fox or two in my day here, scurrying along the border of Rock Creek Park. It’s always a bit surreal to see wildlife pop up on city streets. Need more ideas? 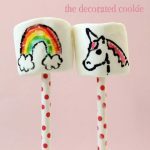 Check out these cotton candy marshmallows, rose garden marshmallows, simple heart marshmallows, and “we go together like…” marshmallows. *You may find some orange and black edible writers in the craft store. Americolor Gourmet Writers are used here, found in specialty stores and online. 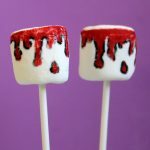 For tons of information on edible writers, click HERE, and see the resources at the bottom of this post. 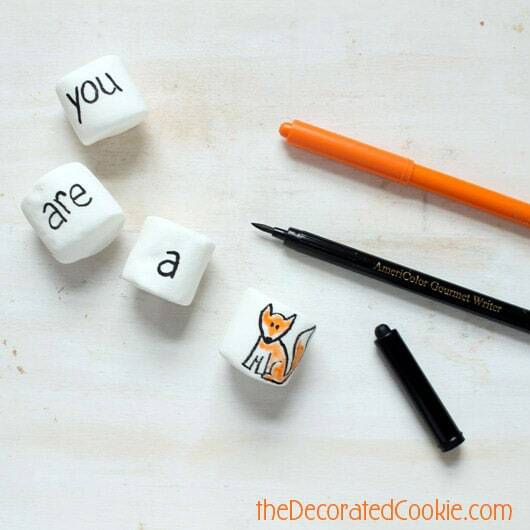 Simply write “you,” “are,” and “a” on three marshmallows. 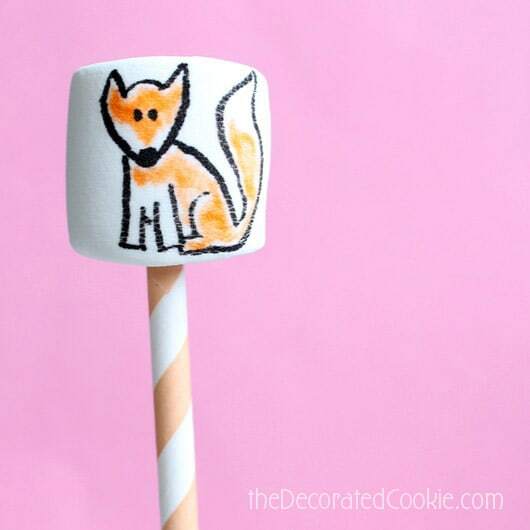 Then follow the steps below to draw the fox on a fourth marshmallow. To package, either wrap as a bunch in cellophane bags closed with ribbon, and let the fox arrange them for the message. Or, put on lollipop sticks or straws. First, draw the head with a black marker, making the chin into a point. Draw two long rectangles for the front legs. Draw the back and hind leg and add a little line between the two front legs. Draw the tail. 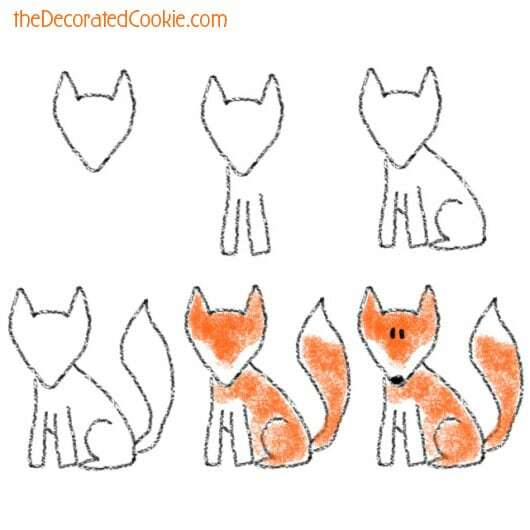 Let the black outline set a bit, and then fill the fox with orange, leaving the cheeks, front legs and chest and tip of the tail white. To avoid picking up any of the black marker from the outline, try and color just inside the outline. Add a dot for the nose at the chin’s point and add two eyes with the black marker.